I recently spent some time with Paya to hear about barmini’s “Wine by the Milliliter” program. Simply put, using a Coravin, Paya and his team members will pour you any amount of wine you want (with a minimum of a 30mL, or about a 1 oz., taste) from a diverse and impressive list of wines, some of which are over thirty years old. Because wine and water weigh virtually the same, the restaurant assumes that a gram of weight is roughly equal to a milliliter of volume. Using a sleek digital scale that has zeroed out the weight of the glass, a server pours from the bottle until you say “when” (you can eyeball it or ask that they stop at a particular measurement). The use of a scale is the killer application of the Coravin. As Paya explains, when offering traditional glasses of expensive wine in a restaurant, servers have the difficult task of getting the pour level exactly right, otherwise one or the other of guest or restaurant will get cheated. The digital readout means all interested parties know where they stand. Think of a butcher slicing deli meat—you can ask for a pound of ham, but can mutually decide on a little more or less once you see it stacked on the paper. Another benefit of using the Coravin is that the restaurant does not have to worry about taking a loss on wine that does not sell by the end of the night—the main reason why wines by the glass normally cost more that the equivalent fraction of the same wine by the bottle. And of course, you don’t have to buy a whole glass if you don’t want to. At Del Posto, it would cost you $200 for a glass of 1996 Gaja Costa Russi, but at barmini, a taste of 1997 Gaja Sori San Lorenzo can be had for just $36 (although after tasting it, you may decide to commit to a bigger pour!). The fun, though, is in the breadth of choices available for tasting. Paya muses, “You’re in the area, you want to pop in and have a drink; your wife orders a cocktail and you get a glass of ’82 Lynch-Bages.” Sure enough, it’s on the list, at $1.07 per milliliter. (I tried it, and it was fantastic.) Paya says that he always wanted to have a reserve wine program at minibar, but it was too difficult to make it work economically for the restaurant with storage costs, etc. Now, he states with delight, barmini can become a “high-end wine bar,” something that is missing in Washington, DC. While Paya expects to continually expand the offerings, at first the choices largely cater to the tastes of the community: downtown DC’s power corridor. Thus, you’ll find Bordeaux and heavy hitters from California such as Harlan Estate and Bryant Family overrepresented on the list for now. All of barmini’s wines were sourced from “reputable sources” like auctions and private collections, according to Paya. Perhaps no source is more reputable than the elBulli Cellar, which was auctioned off earlier this year. Paya worked at elBulli, and was the original purchaser of a lot of the wines up for sale, so it was perhaps a bit strange to be buying them back eight years later. But for some of the wines, he simply could not pass up the opportunity to have them available in his current restaurants. It has been “so far, so good” for Paya at minibar, with wine aficionados embracing the program, and novices thus far showing a willingness to experiment. 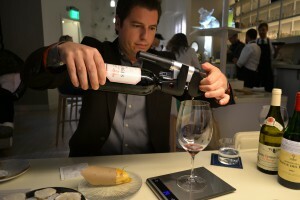 Other Washington restaurants are testing out Coravins as well, mostly with traditional by-the-glass offerings. In addition to Kapnos and Graffiato, mentioned in this Dave McIntyre column, I’ve heard from Simon Stilwell at Rasika and Joe Quinn at Proof that they have the device in hand and are anxious to start literally poking around their cellars. Some day, Paya tells me, he hopes to be pouring “50-year-old La Tâche and Madeira from the 1800’s” via Coravin. If that is not enough to get you salivating, check your pulse. I’ll be lined up at the scale, waiting for a few grams. My own experience with Coravin has been less exciting. I received a sample device from Coravin to review for Terroirist, and have accessed a bottle of 1988 Chateau Cos d’Estournel on three occasions, each time the wine tasting worse than the last. I will post a final review at the end of my three months with the Coravin, but so far, I am not as impressed as Alder Yarrow. I may need to experiment further. Stay tuned. The Coravin sounds interesting but I think I would be more likely to use it on younger wines. Particularly wines I intend to finish within in a few days. Maybe it is unfounded but I wouldn’t be comfortable disturbing truly old wines.